From Stephanie: Life is great isn't it! I still have my love affair with Greek islands, French resorts and Italian towns, as well as Minneapolis. Living in the UK, I don't get back to MN every year but always love it when I can visit. I've been here in the UK for 30 some years now, had a business here with my husband for many years, and just love my friends, family, golf, travel, sailing, skiing, hiking - oh my... there isn't enough time is there? I'm fortunate enough to be staying for the reunion, with Elaine Johnson and her husband Ron (plus my husband Allan of course), also will be seeing Jan Palmer over the weekend. I so look forward to meeting old friends and classmates but you'll have to remind me - memory is slipping, along with all other faculties LOL. Get in touch! My husband and I have lived in the Dallas/Ft. Worth area for the past 23 years. We really love it and DON'T miss the snow and cold. We have been very happily married for almost 32 years. Wow, time sure flies! I retired in Nov. of 2003 from Verizon Communications after 20 years. We are both enjoying our retirement with traveling, reading, exercising (love that chocolate), and lots of other stuff. We were in Mpls. in July for a family get together so we won't be able to be at the reunion. Have a great time and a BIG thank you to the planning commitee. If you are ever in our area please stop by. From Karen: After finishing college at the University of Minnesota, my first profession was a Therapeutic Recreation Specialist... in other words I use to teach people how to have fun!!! In my next life I owned a Sales Agency, traveled all over the USA and still had fun!!! When I sold the agency I pondered what road did I want to travel down next? Now in my third life I work with Seniors to help them to stay in their homes so they can continue to live independently. It is fun to have alot of adoptive grandparents!!! I still enjoy walking the "lakes", being with friends & family, playing with my dog and having fun... I guess I am still a kid at heart... I look forward to seeing everyone at our 40th...hard to believe??? I have been married for almost 39 years to Roger Rubinger (StLP, 64) We have 2 married children that have given us 4 fabulous grandchildren. There is nothing as important as those faces. We are very fortunate in that we spend 6 months at our home in Indian Wells, CA, guess which months? Roger has been retired for 4 years and we enjoy every aspect of our life. From Steve: I hunt for treasure. A magical profession which takes me to lands across the oceans, traveling to auctions and trade fairs in New York, London, Paris, Munich and Zurich. Acquiring artifacts for museums, institutions and private collectors. I am also blessed with a loving wife (Carole Rosen) and two lovely daughters, one of which about to be married. From Paulette: What I want to know is where the heck did 40 years go? I know I've been having a good time, but really! Life has been good. After 35 years of shoveling snow in MN I finally found my way to sunny California back in '89, after spending 5 years in Washington, D.C. I worked on some fascinating projects over the years. I consider myself so lucky because I truly love my job. I am sorry to say that I will be unable to attend the reunion. A conflicting commitment has come up that is unavoidable. Have fun, I'll be thinking of all of you! Send an email...let me know how you're doing. From Deborah: I'm coming to the reunion this time with my best friend and former classmate Mary Oslund and her husband Chuck. It's been awhile since I've seen other fellow classmates around town! Thanks to all who organize and plan these events. I hope to see other familiar faces!! From Steve: How do you retell 40 years of your life? I'm single again after a 20 year marriage. I've been with the same company for 27+ years. I recently gave up my Disc Jockey hobby but as you can tell from the picture, I still play drums. Still have two of our classmates as close friends. From Bobbie: Where doses the time go? It is hard to beleive we graduated from high school 50 years ago!! Randy and I have been married for 24 years and have both been retired for about 3 years now. After living in Birminghm, AL for 6 years then sellng our house there and our house in Chanhaasen, we have been traveling the past 3 winters zeroing in on a location for our retirment home. We are building a house in Fort Myers, Florida and looking forward to moving there this fall. Summers are spent in MN with 3 of our 4 sons, eight grandchildren and many friends. From Roberta (Bobbie): How time flies! I have been busy being self employed for 30 plus years in the west metro area. I am the mother of two beautiful sons, two beautiful step sons and four precious grandchildren. I have been blessed in marriage to a wonderful man. I look forward to seeing old friends and making new ones! From Marilyn: After living in Connecticut for 35 years my husband and I retired to So. Florida (doesn't everyone?) Oh g-d, I think I'm turning into my mother. Anyways, we love it here. My sister still lives in Minnesota and I hope to get there for a visit this spring or summer. Blessed to have Mom, sisters and brother close. Retired, sold real estate in Mtka area. Now I work part time as a senior care giver which is gratifying. From Alan: Currently I am president of Shapco Printing in Mpls. located across from where the new Twins stadium will be located. Shapco is nationally ranked as one of the highest quality printing companies. Before Shapco, I was a prosecuting attorney for the city of St. Paul. I have been happily married to my wife, Carol, for 33 years. We have 3 children; Scott who is the producer of Mike & Mike in the Morning on ESPN, Mark who is in sales for Showtime Network, & Stacy who will be a senior at Emory University in Atlanta. My greatest memories from St. Louis Park are winning a state championship for the mile relay in track & field with my wonderful teammates. I went on to sprinting for the Gophers, & became the President of the U of M letterman's club during Lou Holtz's tenure. If it wasn't for my time running for St. Louis Park none of my accomplishments would have been possible. From Scott: I can't wait to see you guys. I can't believe it has been 40 years, I still feel and act seventeen. From Richard: I've been living in Paris, France for 36 years, have been married for 32, and have been playing the harpsichord professionally for the whole time. 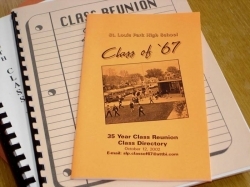 I'd love to come back & see lots of people from SLP... but you keep choosing the wrong dates for our reunions. Some day I'll make it! From Vicki: After a 38 year career as a manger at the Wisconsin Department of Revenue, I retired 6 years ago. Since then, I have taken on several part time project manager engagements, most recently at the Wisconsin Lottery. I have also been an active volunteer for the Madison Trust for Historic Preservation for 10 years, serving as president for four of those years. ​My husband and I will celebrate our 40th wedding anniversary this November. Our son Benjamin is a lawyer based in St. Paul and is married with two great grandsons. Our daughter Emily works in Chicago as a logistics manager.